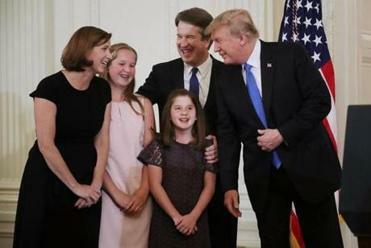 WASHINGTON — President Trump on Monday selected Judge Brett M. Kavanaugh, a politically connected member of Washington’s conservative legal establishment, to fill Justice Anthony M. Kennedy’s seat on the Supreme Court, setting up an epic confirmation battle and potentially cementing the court’s rightward tilt for a generation. Senate Majority Leader Mitch McConnell called Kavanaugh ‘‘a superb choice’’ and said senators would start meeting with him this week. Signaling the fight ahead on abortion rights, Dawn Laguens, executive vice president of Planned Parenthood Federation of America, said in a statement: ‘‘There’s no way to sugarcoat it: With this nomination, the constitutional right to access safe, legal abortion in this country is on the line. The White House invited a number of senators to attend the Monday night announcement.